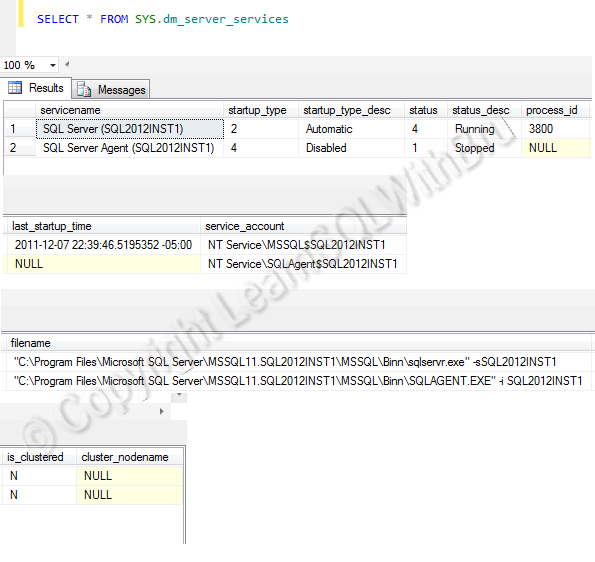 In this blog we shall learn a new Dynamic Management View introduced in SQL Server 2012 called sys.dm_server_services. This dmv can be used to query the startup type, current status, last_startup_time, service accounts under which the service starts, is the service clustered and other related information. The dmv returns output with 11 columns, for better readability, the output is broken down. The data displayed is for the 3 services, SQL Server, SQL Server Agent service and Full-text. The below screenshot displays only 2 rows (for SQL Server and SQL Server Agent) as Full-text is not installed. The following are some of the important startup_type codes: 2 – Automatic, 3 – Manual, 4 – Disabled. Some of the status codes are 1 – Stopped, 4 – Running, 7 – Paused etc.. This entry was posted in SQL Server Administration and tagged DMVs, New Features, SQL Server 2012 by Brumedishetty. Bookmark the permalink. Now automation of tracking downtime will become very easy with the help of new dmv…..sys.dm_server_services.